Uranium One is engaged through its subsidiaries and joint ventures in uranium production, and in the exploration and development of uranium properties, in Kazakhstan, the United States, Tanzania and elsewhere. Uranium One is focused on low cost and low technical risk operations, with existing, near and medium-term production visibility in some of the world’s largest uranium resource jurisdictions. Uranium One is a joint venture partner with JSC NAC Kazatomprom, the Kazakhstan state-owned atomic energy company, in six major producing uranium mines in Kazakhstan – Akdala, South Inkai, Karatau, Akbastau, Zarechnoye and Kharasan. The company also operates the Willow Creek uranium mine in Wyoming, and is the operator of, and owns a 13.9 percent interest in, the Mkuju River uranium development project in Tanzania. Uranium One’s revenues are largely derived from the sale of uranium concentrates. The company sells its uranium to major nuclear utilities in Russia, Europe, North America, South America, Middle East and Asia. Kazakhstan is the world’s leading producer of uranium, accounting for almost 40 percent of global uranium production (24,690 tonnes U in 2016). All uranium is produced by the in situ recovery (ISR) mining method. The country has about 26 percent of the world’s known low-cost uranium resources in the category below $80/kgU. In 2016, Uranium One’s share of the production from its six Kazakhstan joint ventures was 12.73 million lbs. of U3O8 (4,896 tonnes of uranium). In Kazakhstan, Uranium One holds a 70 percent interest in Southern Mining Chemical Company LLC, which owns the Akdala and South Inkai uranium mines; a 50 percent interest in JV Karatau, which owns the Karatau uranium mine; a 50 percent interest in JV Akbastau, which owns the Akbastau uranium mine; a 49.98 percent interest in JV Zarechnoye, which owns the Zarechnoye uranium mine; and a 30 percent interest in JV Khorasan-U, which owns the Kharasan uranium mine. Akbastau is an operating ISR uranium mine comprising the No. 1, 3 and 4 sections of the Budenovskoye uranium deposit, located in the Chu-Sarysu basin of the Suzak region, South Kazakhstan province. Employing about 40 people, Akbastau is owned indirectly as to 50 percent by Uranium One through the Akbastau joint venture, a Kazakhstan limited liability partnership. The other 50 percent interest is owned by Kazatomprom. Akbastau is located adjacent to the Karatau uranium mine. Production began at Akbastau in 2009. Akbastau has the right to carry on exploration, mining and sales operations from the No. 1, 3 and 4 sections of the Budenovskoye uranium deposit under long-term subsoil use contracts with the Government of Kazakhstan. In 2016, production from the Akbastau mine was 4.58 million lbs. of U3O8 (1,762 tonnes of uranium), of which 2.29 million lbs. (881 tonnes of uranium) was attributable to Uranium One. Akbastau entered into a toll processing agreement with Karatau, under which a part of pregnant solutions and eluates produced at Akbastau are currently processed at Karatau. Akdala is an operating in situ recovery (ISR) uranium mine located in the Chu-Sarysu basin of the Suzak region, South Kazakhstan province. With roughly 435 employees, 70 percent of Akdala is owned indirectly by Uranium One through the Southern Mining and Chemical Company (SMCC) joint venture, a Kazakhstan limited liability partnership. The other 30 percent interest is owned by Kazatomprom. Production began at Akdala in 2004. SMCC has the right to carry on exploration, mining and sales operations at Akdala under a long-term subsoil use contract with the Government of Kazakhstan. In 2016, production from the Akdala mine was 2.6 million lbs. of U3O8 (1,000 tonnes of uranium), of which 1.8 million lbs. (700.5 tonnes of uranium) was attributable to Uranium One. South Inkai is an operating ISR uranium mine located in the Chu-Sarysu basin of the Suzak region, South Kazakhstan province that employs approximately 520 people. South Inkai is owned indirectly as to 70 percent by Uranium One through SMCC joint venture, a Kazakhstan limited liability partnership. The other 30 percent interest is owned by Kazatomprom. Production began at South Inkai in 2009. SMCC has the right to carry on exploration, mining and sales operations at South Inkai under a long-term subsoil use contract with the Government of Kazakhstan. In 2016, production from the Akdala mine was 5.3 million lbs. of 3O8 (2,056 tonnes of uranium), of which 3.7 million lbs. (1,439 tonnes of uranium) was attributable to Uranium One. Karatau is an operating ISR uranium mine comprising the No. 2 section of the Budenovskoye uranium deposit, located in the Chu-Sarysu basin of the Suzak region, South Kazakhstan province. Employing approximately 620 people, Karatau is owned indirectly as to 50 percent by Uranium One through the Karatau joint venture, a Kazakhstan limited liability partnership. The other 50 percent interest is owned by Kazatomprom. Karatau is located adjacent to the Akbastau uranium mine. Production began at Karatau in 2009. Karatau has the right to carry on exploration, mining and sales operations in the No. 2 section of the Budenovskoye uranium deposit under a long-term subsoil use contract with the Government of Kazakhstan. In 2016, production from the Karatau mine was 5.4 million lbs. of U3O8 (2,081 tonnes of uranium), of which 2.7 million lbs. (1,040.5 tonnes of uranium) was attributable to Uranium One. Kharasan is an operating ISR uranium mine located in the Syr Darya basin in the Zhanakorgan region, Kyzylorda province, which employs approximately 415 people. Uranium One has a 30 percent indirect interest in the Kharasan mine through a 30 percent interest in Khorasan-U, a Kazakhstan limited liability partnership. The remaining interests in the mine are held by Kazatomprom, as to 33.98 percent, and by a consortium of Japanese utilities and a trading company, as to the balance. 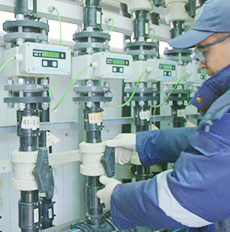 Commercial production began at Kharasan in 2013. Kharasan has the right to carry on exploration, mining and sales operations under a long-term subsoil use contract with the Government of Kazakhstan. In the 2016 year, production from the Kharasan mine was 3.65 million lbs. of U3O8 (1,404 tonnes of uranium), of which 1.1 million lbs. (421 tonnes of uranium) was attributable to Uranium One. Zarechnoye is an operating ISR uranium mine located in the Syr Darya basin in the Otrar district, South Kazakhstan province, which employs approximately 410 people. Uranium One has a 49.98 percent indirect interest in the Zarechnoye uranium mine through the Zarechnoye joint venture, a Kazakhstan joint stock company. Kazatomprom holds an equivalent 49.98 percent interest; the remaining interest is held by a Kyrgyzstan JSC Karabalty Mining Combine. Production began at Zarechnoye in 2009. Zarechnoye has the right to carry on exploration, mining and sales operations under a long-term subsoil use contract with the Government of Kazakhstan. In 2016, production from the Zarechnoye mine was 2.15 million lbs. of U3O8 (828 tonnes of uranium), of which 1.08 million lbs. (414 tonnes of uranium) was attributable to Uranium One. The United States was the world’s leading producer of uranium from 1953 until 1980, when US production peaked at 16,810 tonnes of uranium per year. Until the early 1980s, there were active uranium mines in Arizona, Colorado, New Mexico, South Dakota, Texas, Utah, Washington and Wyoming. In 2015, the United States produced 1,281 tonnes of uranium concentrate; Wyoming accounted for 81 percent of US production. ISR mining accounted for more than 85 percent of US production in 2015. The Willow Creek Mine is an ISR uranium mine located in Johnson and Campbell Counties in Wyoming’s Powder River Basin, approximately 105 km north of the City of Casper, Wyoming. The Willow Creek Mine includes the licensed and permitted Irigaray ISR central processing plant, the Christensen Ranch satellite ISR facility and associated uranium ore bodies. Mining operations at Willow Creek date back to the late 1970’s. The company acquired the property in 2010 and resumed commercial production atWillow Creek in 2012. The Corporation holds an operational license issued by the U.S. Nuclear Regulatory Commission. The design capacity of the Willow Creek mine is 1.3 million lbs. U3O8 (500 tonnes uranium) per year; in 2014 – 2016, production was scaled back and well field development put on hold due to low uranium prices. In 2016, Willow Creek produced 59,900 lbs. of U3O8 (23 tonnes of uranium). In addition to the Willow Creek mine, Uranium One has a number of development and exploration projects in Wyoming’s Powder River Basin, including Ludeman, Allemand Ross, Moore Ranch and Barge, as well as in the Great Divide Basin, including Antelope and JAB. No development or exploration activities are currently being conducted on these projects and properties. Uranium One’s Mkuju River Project, when operational, will be Tanzania’s first uranium mine. It will establish Tanzania among the top 5 producers of uranium in Africa. The Mkuju River Project is a world-class uranium development project located in southern Tanzania, about 470 kilometers southwest of Dar es Salaam. The Mkuju River Project is owned by Mantra Tanzania Ltd.
Current activity at the project is focused on preparatory operations and research work to determine applicability of the in situ recovery (ISR) method, a progressive and environmentally safe mining technology. Uranium One and Mantra are also actively partnering with the government on a technologically advanced and innovative elephant anti-poaching campaign in the area of the southern Selous Game Reserve surrounding the project site. The Mkuju River Project marks the beginning of a long-term commitment to Tanzania and to Africa that will benefit Tanzania and its citizens by creating jobs, providing new local and regional infrastructure, supporting community projects and potentially making it a globally significant producer of uranium. In partnership with the Tanzanian government, Uranium One and Mantra look forward to making a lasting positive impact on the nation’s economy and its people.